Armies often use dummies stuffed with straw for training. A recruit easily trusts his bayonet into the straw man because it cannot fight back. The “straw man fallacy” is an intentional (or unwitting) misrepresentation of a position. A debater attacks the straw man and claims victory over the misrepresented matter, rather than the actual issue. Arguments that rely on the age of the universe to refute creation are thrusting at straw. The Bible never says the Earth is young. It repeatedly calls the Old Testament era the eons – but we live at the terminus of the eons. What does the Bible mean by eons? Job, who lived during the dinosaur age, listed a number of geological events that passed during the few days of his life. One of his geological markers was the sea (Hebrew west) dried. Drill cores from the deep Mediterranean show that it dried eight times leaving gypsum and rock salt sandwiched between thick layers of deep sea oozes. Job 14 mentions how their faces changed (doubled) before they died. If we lived long enough to observe the Mediterranean dry up, our faces would grow Neanderthal brows. However, our grandchildren would have skulls like moderns, as the fossils show. This skull of a Neanderthal old man was found at Gibraltar. Image was uploaded to wikipedia by user AquilaGib and is in under a CC 3.0 license. The ancient poets admitted that the first generations lived in the golden era and durations continue to decrease until, as Hesiod anticipated, children will be born with grey temples. The notion that time exists and is linear only emerged in western Europe during the last few centuries. Attacking the Bible using western assumptions, instead of interpreting it the way a contemporary would understand it, is a straw man attack. Unfortunately, western translators interpret biblical creation texts with our concept of time and our laws of nature. All ancient people had a relational view of reality, rather than a rule-based view. “For though we walk in the flesh, we do not war according to the flesh, for the weapons of our warfare are not of the flesh, but divinely powerful for the destruction of fortresses. We are destroying speculations and every lofty thing raised up against the knowledge of God, and we are taking every thought captive to the obedience of Christ, and we are ready to punish all disobedience, whenever your obedience is complete.” (2 Corinthians 10:3-6) When our obedience is complete, we will use God’s word to bring down the great fortresses of speculative reasoning raised up against the knowledge of God. Does this mean western science? Western science was historically built on the very idea the Bible predicted for the last days – the notion that all things remain the same. He commands us to watch out for the elementary assumptions of the world and philosophy that can take us captive (Colossians 2:8). The literal text is powerful, but the traditional exegesis of creation (that often follows the Latin Vulgate) robs the text of its power. The literal words, rather than westernized exegesis, will triumph over the enemy because we confirm it in the visible history of creation. 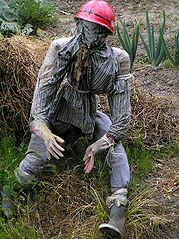 The picture of a straw man is from wikipedia – under a Creative Commons Attribution-Share Alike 3.0 Unported license.